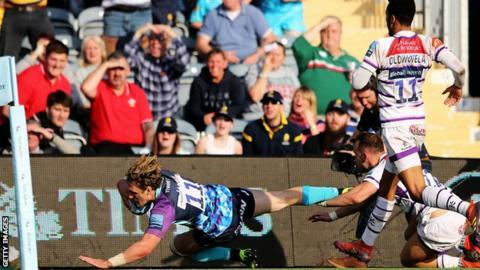 Tom Howe's last-gasp try gave Worcester a dramatic Premiership victory over fellow strugglers Leicester. The winger crossed for a converted score with the final action of a scrappy game to move Warriors a giant step towards top-flight safety. Leicester led 10-3 at half-time thanks to a breakaway try from Jonah Holmes. But Francois Hougaard went over for the hosts after the break before Howe touched down in the corner right at the death. Victory moves Alan Solomons' side up to 10th, nine points clear of bottom side Newcastle and just four behind ninth-placed Leicester. The home side struck first with a 15th-minute penalty from Matt Toomua and Leicester were denied an immediate response when they won a lineout and Jordan Olowofela went over, only for the TMO to rule out the try for a forward pass. Duncan Weir levelled the scores before Worcester camped out on the Leicester try line and seemed certain to score before a blind pass by Weir was intercepted by Holmes, who ran the length of the field for the game's opening try for the Tigers with Toomua adding the extra points. Weir failed to find the target with two penalties, with Leicester having another try ruled out just before half-time for obstruction after Ben White touched down. Worcester levelled things up early in the second half when Hougaard went over and Weir slotted the conversion. After a scrappy opening to the second half, half-time replacement Tom Hardwick edged Leicester back ahead with a penalty with 14 minutes remaining. In the closing stages Worcester wasted two lineouts close to the Leicester try-line, but they finally snatched victory as Howe finished a fast move in the corner. "I say to our supporters to always stay to the end as there have been a number of occasions when we've done it in the dying stages. "At times we didn't play enough to secure field positions but on balance, we deserved to edge it. "We won't be resting on our laurels as this competition is so strong and incredibly tight." "It's incredibly disappointing because I asked for physicality and workrate, which are two important things away from home. "I thought the boys worked incredibly well for large parts of the game but basic errors cost us. "We came out at the start of the second half and talked about upping our game and we didn't. We made some very poor individual mistakes. "We didn't deserve to win, I don't think, on the back of those individual errors." Worcester: Pennell; Heem, Venter, Mills (capt), Howe, Weir, Hougaard; Waller, Singleton, Schonert, Bresler, Fatialofa, Hill, Lewis, Mama. Replacements: Miller, Black, Milasinovich, Phillips, Cox, Heaney, Lance, Lawrence. Replacements: Polota-Nau, Ma'afu, Heyes, Spencer, Thompson, Simmons, Hardwick, Aspland-Robinson.